Punkte Benötigt: 21150 Software ist nicht kompatibel mit mobilen Geräten und Tablets. Bitte füge diesen Titel zu deiner Wunschliste hinzu und logge dich auf einem Desktopcomputer in deinen the first club Account ein, um die Einlösung abzuschließen. NOTICE: Activation key must be used on a valid Steam account, requires internet connection. 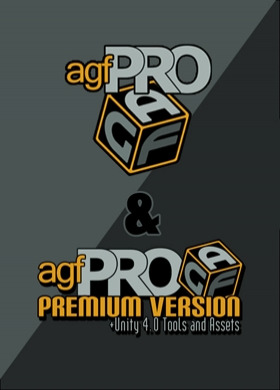 AGFPRO PREMIUM BUNDLE	This bundle includes: AGFPRO Basic Edition V3AGFPRO V3 PREMIUM (DLC) ABOUT THE GAME	AGFPRO v3.0 is a comprehensive toolset designed to provide game developers and enthusiasts with a powerful and rapid level creation, terrain/vegetation editing, lighting and atmosphere system.AGF is a… n independent product that empowers users to create game levels and environments for many types of game genres, and the AGFPRO v3.0 PREMIUM version is also designed to work in concert with the Free and Pro versions of the Unity 5 game engine to allow further customization and game publishing. AGF runs on the PC, MAC and LINUX systems.AGF allows developers to rapidly create game maps, sculpt terrain and design levels quickly and easily. With over 1000+ assets pre-stocked in the warehouse, along with 48 pre-set themes and 8 sample maps, developers and enthusiasts can begin creating levels in minutes. AGFPRO v3.0 includes all of the necessary tools to allow users the ability to import AGF scenes into Unity3d Free and Pro 5.Creating game levels and maps in AGFPRO is easy and fun - now ANYONE can create their own quality game maps without having to program, model or animate! KEY FEATURESAGFPRO v3.0 now Features Nine (9) Key Areas or Apps for Development that include:AGF Launch PadAGF World EditorAGF Construct AppAGF BrowserAGF PackagerAGF Scene LoaderARGP Player (Internal & External)Platform Player (Internal & External)FPS Player (External)New v3.0 AGF Launch Pad:This App replaces the AGF editor from the AGF icon in SteamLaunches all AGF Apps including the Editor from one toolbarNo need to go through the Editor to launch the Players	New v3.0 AGF World Editor Features:Redesigned GUI in the EditorDropdown menu systemCollapsing, drag-able windows with easy to see icons3x Speed increase for terrain sculptingNew Smoothing feature for the terrain sculpting has been added to give the user the ability to smooth and soften terrain on their mapsNew X, Y, Z directional compass added to the EditorCamera automatically changes the atmosphere when users are underwater vs. above waterAddition of Build Time Clock that is saved with each scene file every time users work, creating a standing time on how long each level takes to createUser-Friendly Project Creation WizardExtensive library of pre-set themes for immediate level designThemes include lighting, atmosphere, terrain, vegetation, & water pre-definedIntuitive User Interface with Radial Menu to expedite workflow Drag and reorganize windows to customize UIOn & Off feature quickly hide menusAdvanced Terrain Creation SystemAdjustable: terrain size, splat map & vegetation detail resolutionSupports terrains from 200 meters up to 200 meters down maxTerrains are now expanded to a maximum terrain of 4,000 meters square3x Speed increase for terrain sculpting10 levels of undo for terrain editingUndo Vegetation, Painting and Sculpting independent of each otherPaint, Sculpt and Plant vegetation individually or simultaneouslyToggle: terrain visibility, painting, sculpting, plantingSophisticated Brush SupportExtensive brush library with adjustable brush size, rotation, power, blendEdit the entire Default Brush library for users preferenceProject specific and default brushes independent of each otherVia the new integrated AGF Browser, users can now import their own original: Brushes, Terrain Textures, Terrain Vegetation Textures in PNG. FormatNewly added: Custom Images can be both loaded and removed for the Brushes – Terrain and VegetationReal Time Terrain Deformation and Painting System with Tri-Planar Texturing with Normal MapsToggle between tri-planar shader & simpleIntuitive Terrain Snap to Grid Height to set terrainNumeric input and readout of terrain height at specific locationsTri-Planar Shaders and TexturingShader automatically maps terrain inclines with user defined textureOver 40 textures included with Normal MapsTerrain Texture Color Tinting FeatureChange individual textures or batchChange terrain textures quickly and update in real-timeAdvanced Vegetation SystemAdjustable vegetation density & distance, unlimited layersSet vegetation min. width, height & color spectrumAdvanced Global Vegetation EditorGlobally change vegetation color saturation, value, size, minimum width & height, color spectrumsFully featured lighting and atmosphere configuration allows quick real time and run-time customizationCustomized Lighting SystemKey, Fill, Back, and Ambient light sourcesSet light colors, flares & shadow configurationsExtensive Lens Flares to “main” light in lighting rig (over 15)Newly added Underwater Lighting systemFog SystemGlobal and simple fog with a variety of parameters: density, falloff, color and distanceSet fog haze, density, distance, color, height and falloffNewly added Fog System Skyboxes – Select skybox cube maps with the ability to apply rotation & tintBeautiful water system with sliders for wave direction, speed, intensity, refraction/reflection color and foam propertiesGeometry Brush SystemCreate unlimited sets of geometry brushesBrushes function as an independent layer to editSet min/max scale rangeRandomly rotate X, Y, Z coordinatesAlign to NormalSpray geometry from camera view directionUser-friendly file saving thumbnail generation for scenes when savedExtensive Presets to quickly start scenes (48 included)Create custom presets and share with friendsIndependent Pre-Fab Mode to create complex collections of assets outside of your scene	Fully featured transformation tools include:Select, Multiple-Select, Copy/Paste, Duplicate, Translate, Rotate & ScaleIntuitive Grid-Snapping and Collision Detection easily place objects in scene with new enhanced features that include:On screen display of Grid SizeOn screen display of Grid-Snap SettingThere are now reference numbers for both the X or Z Axis, the numbers change dynamically with the scale of the gridGrid Reference Number Scaling and Display Settings can be defined by the user	New Construct App Feature:Gone is the old prefab workspace and it has been moved into its very own App Construct is where you go to create your own prefab assets from the always-expanding library of textures and assets (over 1,000+) that are available in the AGFPRO WarehouseUsers can launch Construct from the Launchpad or from the EditorUse the “refresh assets” button to load prefabs into the Warehouse libraryConstruct allows users to import their own .OBJ files (objects or assets) as well as .PNG texture filesLoad your own models, .OBJ files, directly into Construct – USERS NO LONGER HAVE TO IMPORT THEIR OWN ASSETS THROUGH UNITY PRO!!!!! This feature is included in AGFPRO and Premium.Combine several .OBJ files and save them as a Prefab to be used in the World Editor	New AGF Browser (file browser)This is a standalone browser that connects the AGF Apps together!The new AGF Browser is designed to be the glue that is used to bring in users custom content. Now users are able to bring in their own Textures and Objects files into AGF creations without the necessity of using Unity Free or Unity Pro… This feature is HUGE as it empowers users the flexibility to create their own custom levels with any supported asset types they choose to bring in with the ability to take their scene files back into Unity to publish their own work New AGF PackagerBy popular demand – we have added this great feature… AGF DLC users are able to package their games easily and share with anyone! Just do the following:1) Select the Game Type 2) Select the Project Folder3) Select the Destination of the New Game onto User’s Machine4) Give a Name to the Game… And the AGF Packager does the rest… it’s really that easy! Best of all, friends do not need to own AGF to run the packaged game, nor do they need to have a Steam account. The Packaged Game is completely stand-alone, DRM FREE, and redistribution of users game(s) is encouraged. AGF Packager will make a game for the OS that it was packaged on. The AGF packaged games are NOT intended for resale. It’s about creating and sharing with all.As an option, the Packager will automatically zip the game(s) package for easy distribution and no installation is required for the end user to play – no installers are necessary for friends to play – just unzip and have fun! New AGF Scene Loader Features:The AGF Scene Loader loads the AGF Scene Format into Unity Free and Unity ProCustom Images that are used on terrains now load into Unity with scene(s) created in AGFAny locked assets in an AGF scene are no longer an issue… The AGF/Unity Scene Loader skips any assets that are not supposed to load automatically Any OBJ files that are loaded into AGF will also be loaded into Unity Free and Pro	Action Role-Playing Game Player:The ARGP Player provides users with player and camera controls that are genre specific for ARPG game creationUsing the Internal Player, creations can be played in real-time to play test map creations The External Player allows users the ability to package and send their levels to others to play	Platform Player:The Platform Player provides users with player and camera controls that are genre specific for Platform game level creationThe Internal Player allows users to immediately play and test their game maps in real-timeThe External Player allows users the ability to package and send their levels to others to play	First-Person Shooter Player:This Player provides the user with an FPS camera and controller, specific for FPS game level creation and play testingThe FPS Player can be used with the AGF Packager to package their game levels to share with othersThis Player also supports Scene-Linking and allows users to share their AGF FPS game level creations with friends and link their maps together for endless gameplay!FPS Weapon asset packs are also included	AGFPRO v3.0 PREMIUMAGFPRO + PREMIUM ASSET Packager – users are able to package their assets in Unity Pro and use in the AGF tool-setBatch Asset ProcessingAutomatic Icon CreationOver 500 Source Art Assets and Samples are included for Premium users	More Information on what AGFPRO is and what you can do with AGFPROUsers are able to create game levels and maps using the software and also place characters (provided with the software) to play and explore their levels with multiple player style options (Action Role Playing, Platformer, FPS)Just to be CLEAR – AGFPRO is NOT a game engine. It is literally made using the Unity game engine. AGFPRO is a real-time, RAPID Game Environment Development Toolkit and is made to be used in concert with Unity Free and Pro for level/map creation. – However, AGFPRO does NOT need Unity to run or create levels/maps.The scene files that users create in AGFPRO “Basic” and “Premium” can be imported into Unity4 Free and Pro using our AGF/Unity tools. SYSTEM REQUIREMENTS Windows	Minimum: OS: Windows 7 or better Processor: One Intel or AMD 3.0 GHz processor(s) or better Memory: 1 GB RAM Graphics: Nvidia video cards made in 2009 - 2013 Intel 4000 - 5000 DirectX: Version 10 Hard Drive: 700 MB available space Sound Card: N/A Additional Notes: On 64 bit machines the following must be installed - Microsoft Visual C++ Redist (64)	Recommended: OS: Windows 7 or better Processor: Eight Intel or AMD 3.0 GHz processor(s) or better Memory: 16 GB RAM Graphics: Nvidia Geforce GTX Titan DirectX: Version 11 Hard Drive: 700 MB available space Sound Card: N/A Additional Notes: On 64 bit machines the following must be installed - Microsoft Visual C++ Redist (64) Mac	Minimum: OS: Snow Leopard or better Processor: One Intel 3.0 GHz processor(s) or better Memory: 1 GB RAM Graphics: Nvidia video cards made in 2009 - 2013 Intel 4000 - 5000 Hard Drive: 700 MB available space Sound Card: N/A Additional Notes: More is better	Recommended: OS: Snow Leopard or better Processor: Eight Intel or AMD 3.0 GHz processor(s) or better Memory: 16 GB RAM Graphics: Nvidia Geforce GTX Titan Hard Drive: 700 MB available space Sound Card: N/A Additional Notes: More is betterLinux Minimum: OS: Ubuntu 12.04 or better Processor: Intel or AMD Memory: 1 GB RAM Graphics: Nvidia video cards made in 2009 - 2013 Intel 4000 - 5000 Hard Drive: 700 MB available space Sound Card: N/A Additional Notes: More is better AGF PRO v03.0 and the AGF PRO v03.0 logo are registered trademarks of Axis Game Factory, LLC. All other trademarks are the property of their respective owners. © 2015 Axisgamefactory.com or its affiliates. All rights reserved.